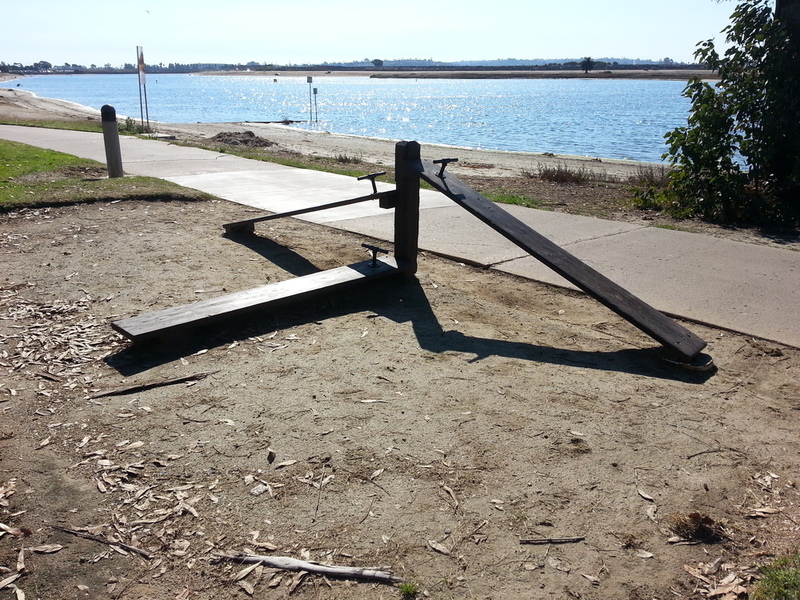 A great playground structure in Tecolote Shores Park by Mission Bay, San Diego, CA. Located in Chula Vista to the west of the 5 Freeway the J Street Marina provides park-goers with a great place to exercise and a view of the San Diego Bay. The exercise equipment is located on the northern area of the park and is adjacent to Plover Way which has free parking. 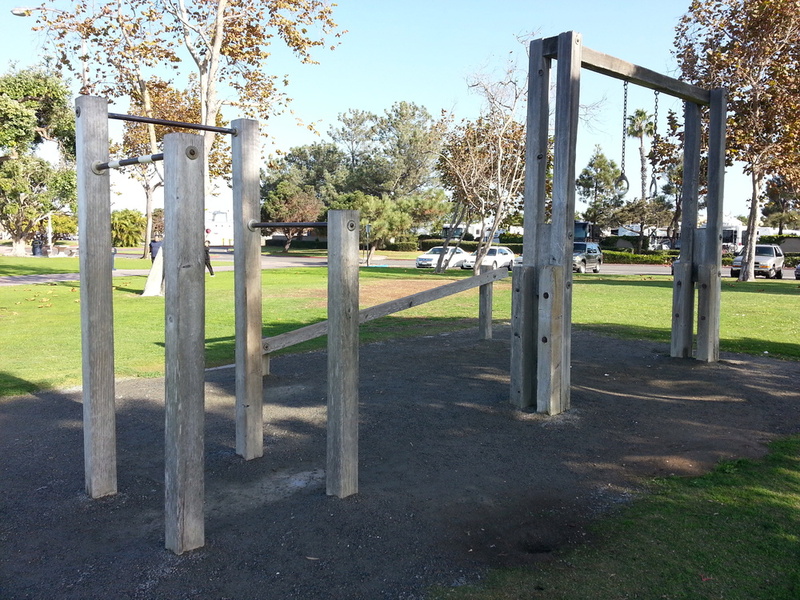 The equipment overlooks the San Diego bay and consist of a set of gymnastic rings, pull-up bars, and an incline beam. If you are hoping to workout in the shade this location is excellent in the morning and evening due to the large trees on either side of the structures. Additionally, the J Street Marina has a sand volleyball court, public restrooms, and a fishing dock. Outdoor physical training and fitness space in J Street Marina, Chula Vista. 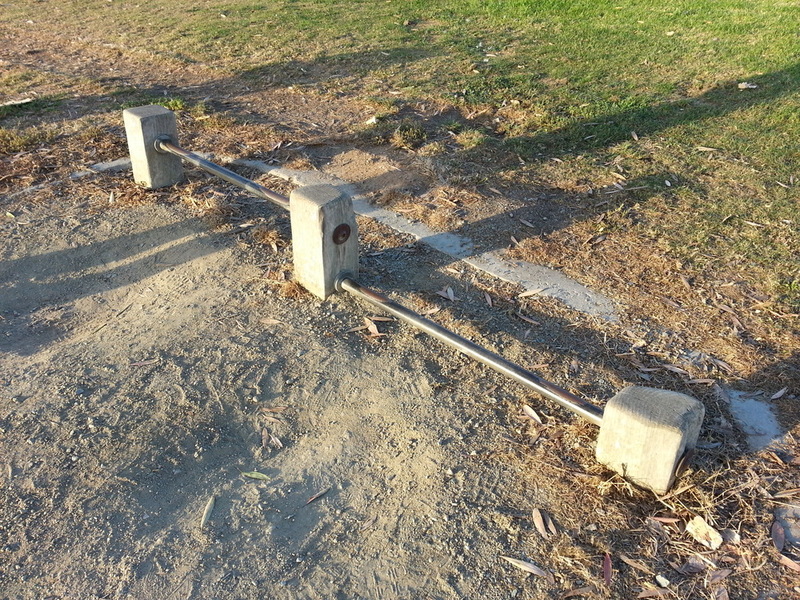 Pull up bars and balance beam for physical training in J Street Marina, Chula Vista. Named after Fred H. Rohr, a successful aerostructure manufacturer, Rohr park is located in the heart of a small town called Bonita. Entrances for Rohr Park are located off of Sweetwater Road, however, Entrances B and C are significantly closer to the exercise equipment. The exercise equipment is located at the beginning of a 3.5 mile trail that encompasses the park and neighboring golf course. This park has an adult size set of monkey bars, parallel bars, vault bar, decline sit-up benches and a few stretching sites. The bars at this park are painted with a metal paint that makes gripping them more manageable. There are also two basketball courts, a baseball field and public restrooms near by. Amongst the sunbathers and cyclists, one of the best outdoor exercise structures is located in Mission Beach. 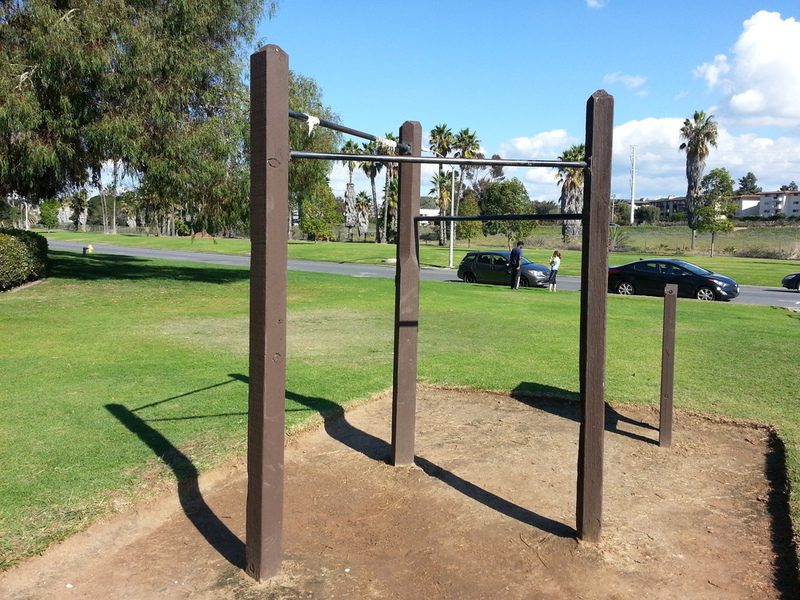 Just off of the 5 Freeway, Tecolote Shores Park offers exercisers with a structure that has 5 pull-up bars, an adult size set of monkey bars, 3 parallel bars and a firemans pole. There is also a jungle gym and vaulting wedges in the vicinity. These structures are placed in sand so feel free to kick off your shoes and enjoy the sand in between your toes. 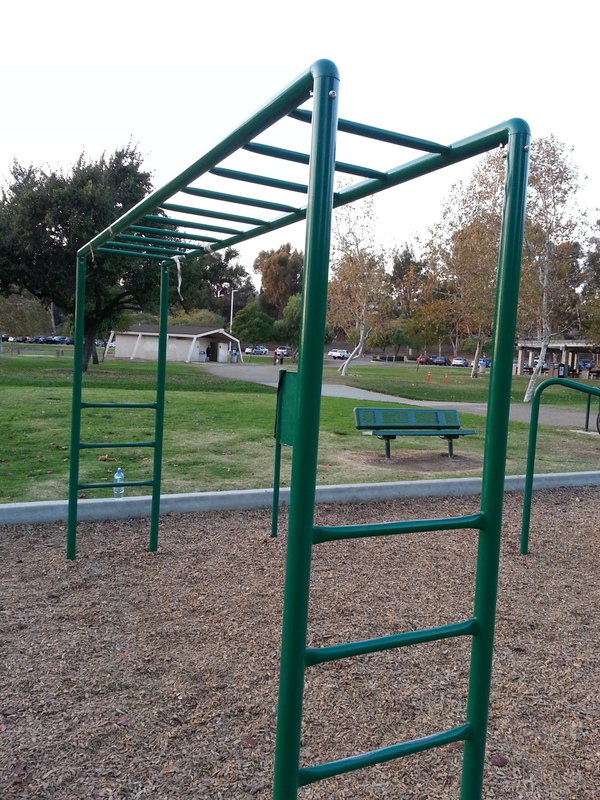 If you still want more to do there are another set of monkey bars, 3 decline sit-up benches varied height of push-up bars and 3 pull-up bars to the north of the main structure. The monkey bars and 3 decline sit-up benches are placed along the main walking path near the water. The pull-up bars and push-up bars are located north east of the main structure and are closer to the street parking. While these are tougher to find the pull-up bars are in a great location if you are interested in working out in solitude. The park also offers various water sports, several larger open fields and public restrooms. Only a minute away from the Convention Center, the Embarcadero is a great place to visit if you are working out in the Downtown San Diego area. With a killer view of the San Diego city scape and the bay, the Embarcadero offers park-goers with seven exercise equipment stations along a quarter mile loop. The structures are located in the southern park and include two pairs of gymnastic rings of varying height, parallel bars, push-up bars of varying height, pull-up bars, high jump touch beam, and a balance beam. Each of the stations are less than 200 feet from each others which allows you to create your own circuit that incorporate both aerobic and strength exercises. The only downside is that you have to remember to bring coins to pay for parking if you plan on visiting on weekdays or Saturday. There are also basketball courts and public restrooms near the parking lot. The Patch stands out amongst all the other parks. Inspired by The United States Military and The Egoscue Method, The Patch was designed to incorporate strength, cardio, agility and endurance into one challenge that encourages total natural function. Even though The Patch is located in Torrey Pines High School it is open to the public and it is not uncommon for professional athletes to train here. The structures are located directly east of the baseball field and are shaded in the afternoon by a grove of eucalyptus trees. The Patch does offer pull-up bars and areas to practice vaulting. Additionally, the structures can be used to provide participants with less common exercises such as step unders/overs, bear crawls, crab walks, and duck walking. The Patch allows participants to create circuits which could be great for preparing for an event like Alpha Warrior or Tough Mudder. There is no public restroom available when classes are not occurring. 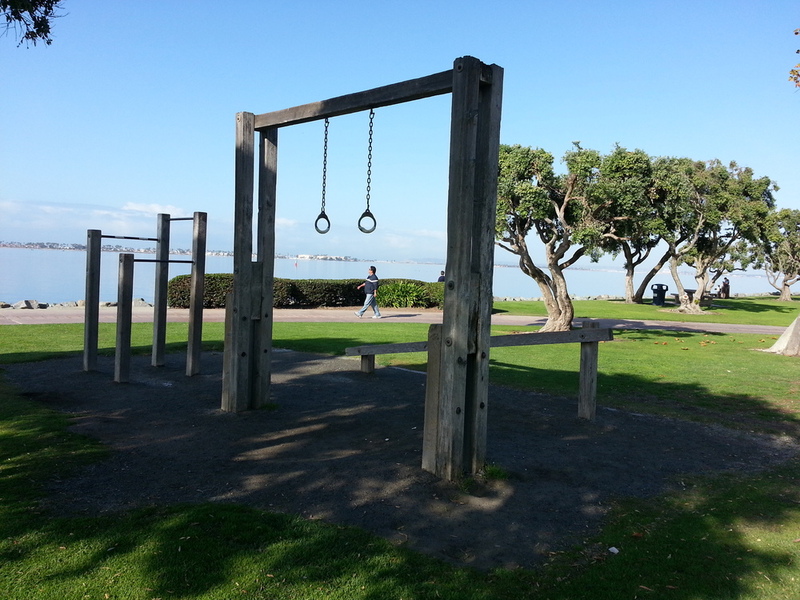 San Diego parks offer exercisers a great variety of locations for bodyweight training and conditioning. Where else are you training outside? What are your favorite bodyweight exercises? Share your favorite outdoor workout spots in the comment section or on Strong Made Simple’s Facebook page. Like this post and want to get more info about fitness in San Diego? Yes, I want more info about fitness and events in San Diego! Thank you! You're almost done. Now just check your email and confirm your subscription via the link provided. Thank you again for joining the Strong Made Simple newsletter.